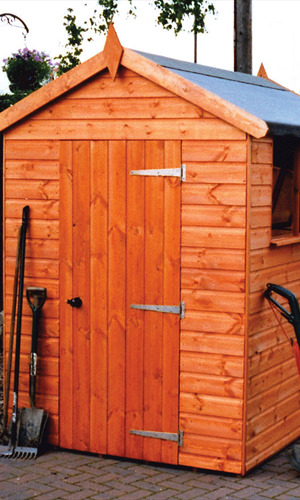 Donington Nurseries act as agents for a reputable family-owned shed manufacturer and we offer a choice of well-constructed sheds, tool tidy’s and Garages in Derbyshire & Nottinghamshire. Depending on the size and style of the shed a number of extra options are available including heavy duty felt, framing and floorboards, security options, door widths, double doors, stable doors, door positions. Some heights can also be increased. Should you require a particular size that is not normally available, it can usually be made to order provided door widths and stability do not pose a problem. Please contact us with your requirements, and if it is feasible we will provide a quotation. When buying any garden building, it is necessary to construct a base for your building to be erected onto. This does not need to be elaborate as long as it is level and firm. Concrete or slabs are best but a membrane with gravel would also suffice. We always recommend floor bearers with any shed purchase even if the base the shed will stand on is concrete or slabs. These are tanalised treated timber of 3” x 3”, which would be laid under the building in the opposite direction to the floor joist. This enables a building to be lifted off the ground so it is away from any surface water and allows air to circulate under your shed preventing condensation and damp build up.